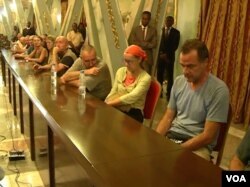 Authorities in Cameroon have freed 18 people, including 12 European tourists, who were seized by armed separatists fighting for the independence of the country's English-speaking regions. Dozens of hostages are still in captivity. Twelve of the 18 former hostages looked tired, hungry and unkempt as they arrived in Yaounde Tuesday. They refused to grant interviews. Communications Minister Issa Tchiroma said the seven Swiss nationals and five Italians were freed from the bushes of Manyu, an administrative unit on Cameroon's southwestern border with Nigeria, after a battle between Cameroon government troops and armed separatists. Tchiroma said local residents told the military where the hostages had been taken. He said the 12 tourists regained their freedom thanks to the collaboration between the population, self defense groups and forces of law and order, and that many hostage takers were neutralized. Tchiroma said the tourists were visiting a twin lake in the locality of Nguti when armed men seized their vehicle and held them hostage for several days. After they were freed, the tourists were taken to a hospital for medical care. They will later be handed over to their embassies for return travel formalities. Six municipal councilors who were kidnapped in the northwest while going to vote in the country's senatorial election have also been freed. The separatists had warned them not to vote, saying that English speaking Cameroon was now an independent country called Ambazonia and will not accept any election organized by a foreign country. Last week, a Tunisian was killed in another operation in Manyu Division in which four engineers were freed. Cameroon said at least a dozen other people including two senior state officials are still being held hostage by the separatists. Didier Bajeck, a spokesperson for the Cameroon military, said allegations the military commits atrocities while fighting separatists are lies that should not discourage the population from working with them. He said the military has remained professional even though the terrorists are using social media to accuse them of committing atrocities. He said they will fight until all Cameroon is free and all those held hostage released. Tensions started in Cameroon in 2016 when English-speaking teachers and lawyers went on strike to protest what they called the overbearing use of French. The government says hundreds of people, including 30 policemen and soldiers have been killed this year. Embassies in Cameroon have been cautioning their nationals against traveling to the English speaking regions.